Zucchini with its high water content and antioxidants is going to revitalise, hydrate and enhance your skin in many ways. With a consumption of zucchini you are going to flush out harmful toxins from your body, restore the moisture of your skin and promote hair growth. Powerful antioxidants from zucchini are fighting free radicals naturally and improving appearance of your skin by removing fine lines and wrinkles. Manganese from a raw or cooked zucchini is one of the important ingredients involved in collagen formation, consequently in skin preservation and wound healing. 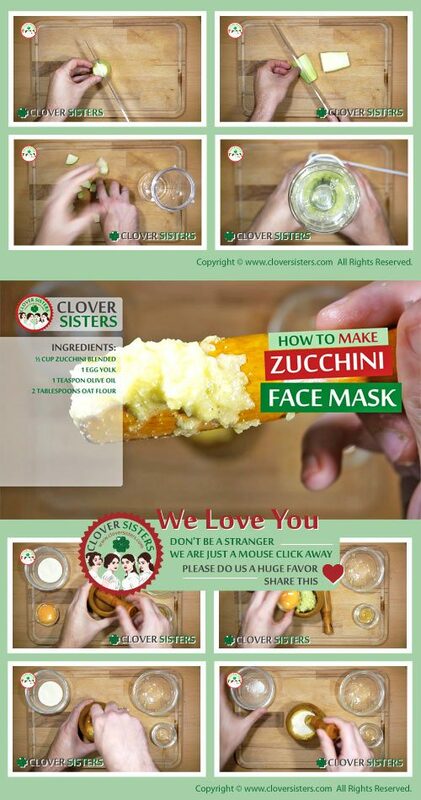 You can use zucchini topically if you want to remove puffy bags around your eyes. Hydrated skin equals happy skin, and if your face feels taught, rough and dry try to moisturize it to get the baby like skin that you will adore. Finding the right way to moisturize your face can be a battle and before you reach for that bottle of lotion try some natural moisturizer with high water content like zucchini. Our body naturally makes collagen, a component of skin tissue, but as we age collagen production begins to decline. One study suggests that manganese can help boost collagen production and it’s a great way to increase collagen naturally. Vegetables like zucchini are natural sources of manganese and very beneficial for the formation of collagen. When it comes to skin beauty benefits, antioxidants work by speeding up the skin’s natural repair systems. They play an important lifeline role in superior face and returning your skin to its natural state of health and beauty. Vitamins A and C found in zucchinis counter natural aging process and offer superior sun protection. Blend half a cup of zucchini, add 1 egg yolk, 1 teaspoon of olive oil and 2 tablespoons of oat flour. Combine well. Apply at list twice a week, massage skin with this paste for few minutes then rinse off with lukewarm water.